Thanks for taking the evaluation survey! Your responses have been sent. Thanks for taking the values survey! Your responses have been sent. We believe daily actions by individuals can help preserve the water in lakes and rivers. Shoreline property owners in particular can play a significant role by taking positive actions to protect and enhance their shoreline properties. Check out our Shoreline Action Checklist PDF to see what positive steps you’ve already taken and potential actions you can take now and in the future. 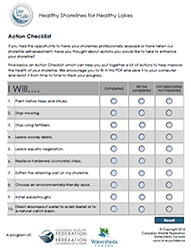 Download the Action Checklist PDF to track your plans for improving and maintaining your shoreline health!